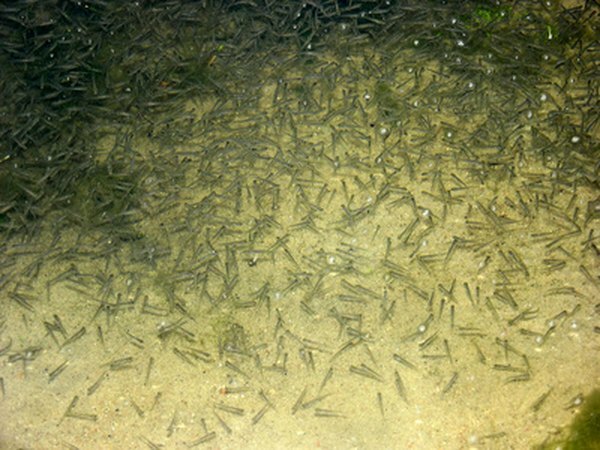 Bigger fish will eat baby guppies if they get the chance. Keeping your guppy babies separate from the bigger fish in your main tank is essential if you want them to survive. Sooner or later, though, you’ll want to move them into your big tank. You can do it safely, if you know what to watch for. Before you can move your baby guppies into your big tank, they need to be large enough that the other fish won’t eat them. 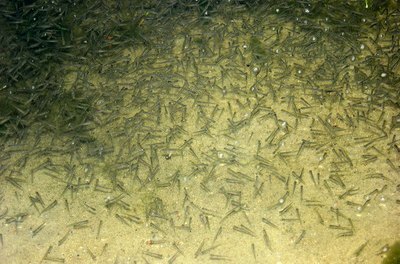 Exactly how large depends on the size of the fish in the main tank, but the minimum size the babies should be before you move them is about an inch long. If that’s small enough for some of your other fish to eat, give the baby guppies a bit more time to grow, until they’re too big to be swallowed. Watch both your baby guppies and the fish in your big tank to make sure that all of them are in good health. While it’s likely that everything is fine, if you’ve recently added a new fish to your community tank, it’s possible he could have brought a problem with him. Trouble can also crop up from sudden temperature changes, such as during a power outage or extreme heat wave that may stress your fish. Check to make sure they’re all swimming normally and there’s no sign of white spots on their fins, mouths or sides. Guppies grow at different rates, so you won’t be able to tell for sure in advance just how long it’s going to take for them to get big enough to move. They are also affected by diet, temperature and water conditions. To speed things along, give them a good variety of foods, including live foods such as daphnia, bloodworms and brine shrimp. Keeping the babies’ tank at about 80 degrees boosts their metabolism and helps them to grow quickly, and replacing about half the water every week also gives them a boost. Before you put the baby guppies into the big tank, make sure there’s plenty of places for them to hide. Plants are ideal shelter for young guppies and will help them make the transition from their baby tank to the larger community aquarium more easily. Make sure that both tanks are at about the same temperature, so the babies will adjust easily. Feeding the fish in the community tank shortly before putting the youngsters in there may help to reduce the larger fishes’ interest in the newcomers, at least as a potential meal. When Does a Baby Guppy Get Color?